Applications are now closed. Please check back Fall 2019. 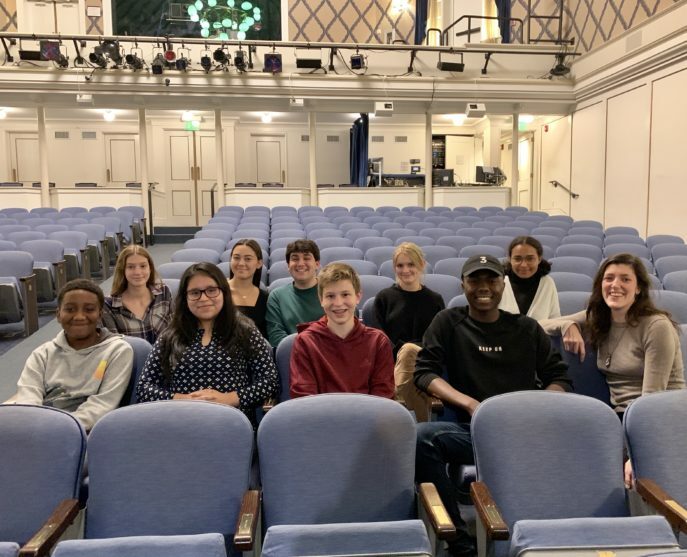 The Guild Hall Teen Arts Council (GHTAC) is a newly launched program that offers ten teenagers per year the opportunity to work for Guild Hall as content producers, curators, and programmers. Modeled after the Walker Art Center’s pioneering program, the GHTAC meets weekly with a GH coordinator to generate programming for their peers. GHTAC members are chosen yearly by an application process and are paid for their work. Once on the council, they are members until they graduate. The Spring 2017 council represented students from all four local private and public schools, grades 9-12. They bubbled over with fresh ideas. They organized a program in the Guild Hall Gatherings networking series designed to connect interdisciplinary artists with local professionals and residents. As we all know, and as many studies have proven, engaging adolescents adds value to any organization. Giving teens meaningful art experiences helps them relate better with their peers and adult mentors and helps them grow exponentially as individuals. We as an institution can also benefit from their energy, insights, and points of view. Nurturing young people is nurturing our future, and it is mandatory if we want the arts to survive and thrive. The Teen Arts Council has defined its mission as building an immersive environment where teens can regularly create, making Guild Hall accessible and affordable to teens, and serving as a conduit for interaction among teens of all the town schools. The GHTAC is an important component of Guild Hall’s mission to educate and inspire a diverse audience and to serve as a gathering place for members of the community. Beyond the professional experience we can offer our Council members, we acknowledge the boundless creativity of teenagers and the value and relevance they bring to Guild Hall. Student production with teens writing, directing, and acting. Master Classes and many more ideas under consideration for the Fall. Building an immersive environment where teens can regularly create content and programming while furthering positive interaction among students in our local schools. Since graduating from Emerson College in 2011 with a degree in Producing, Corey has explored many different aspects of the entertainment and art world. She has worked with local grassroots theater companies, such as the Neo-Political Cowgirls, creating immersive theater as well as worked in film. She has built sets and gathered props for large and small scale productions. Corey has served as Guild Hall’s Company Manager for the past two summers and has worked with many performers and artists. She has also coordinated a summer camp in the Hamptons with the goal of having children discover and explore their passions.